Global Peace Index 2014 survey reveals continued high scores for Uruguay, Chile, and Costa Rica; improvements for Argentina, Bolivia, and Paraguay; and persistence of violence in Colombia, Mexico, and Venezuela. The 2014 edition of the Global Peace Index (GPI), a survey and ranking of most of the world’s countries and their levels of conflict and security, was released on 20 June by its authors, the Institute for Economics and Peace. The study reveals that global peace has declined year-on-year, with Iceland maintaining its position as the world’s most peaceful nation while Syria has displaced Afghanistan at the bottom of the rankings. Other notable developments since last year’s edition include the deterioration of the situation in South Sudan and the ongoing tensions between Ukraine and Russia. However, for Latin American countries the past year has seen few major changes, with South America as a region scoring slightly better than the global average and Central America and the Caribbean scoring slightly worse. Uruguay, often seen as one of the most socially liberal countries in Latin America remains the most peaceful nation, despite a slight fall due to an increase in the number of its domestic police and security forces, and is ranked 29th in the world, one ahead of Chile, with Argentina a bit further behind in 43rd. Costa Rica is the highest-ranked Central American country at 42nd in the world, followed by Panama and Nicaragua at 57th and 58th respectively. Argentina, along with Bolivia (70th worldwide) and Paraguay (73rd) were Latin America’s biggest improvers on last year, while the most marked deteriorations were seen in Colombia, Guyana, Haiti and Venezuela. Colombia remains the region’s lowest ranked nation, coming in 150th out of the 162 countries included in the survey. According to the report, “Colombia continues to suffer as a result of refugees and displacements, which are the product of its ongoing conflict with the [FARC] guerrillas”. However, it also notes that “ongoing peace negotiations with the government, (and) which are strongly supported by the population, offer some hope of an improvement”. Perhaps surprisingly given the headlines about protests and political instability coming out of Venezuela in recent months, it has not suffered a more severe decline and is still considered to be more ‘peaceful’ than its neighbour Colombia, although it is still 2nd last in South America and 3rd overall in Latin America, with a global ranking of 129th. Mexico, which “continues to be mired in a vicious drug war” and “fell further due to an increase in the number of internal security officers, as crime-related indicators remained static over the past year”, is ranked 138th overall, the worst of the Central American countries. The report also noted that Central America was the lowest-ranked region in the world for homicides and violent crime, with the “golden triangle” of Guatemala, El Salvador and Honduras maintaining “stubbornly high” levels of criminality and violence. However, the GPI offers a sense of optimism for both sub-regions within Latin America. It notes that in South America, “major episodes of political disruption, such as that which took place during the removal of the former president, Fernando Lugo, in Paraguay in 2012, did not take place, while the death of Venezuela’s Hugo Chávez in March 2013 resulted in a relatively peaceful transition”. In Central America and the Caribbean, many of the countries including Mexico were said to “benefit from the absence of intra-regional conflicts, friendly relations with neighbours and minimal nuclear and heavy-weapons capabilities among them”. Brazil, Chile and Uruguay were among the six countries given the best possible score on “Ongoing conflict”, which the GPI defines as meaning that “these countries have not been involved in any external conflicts in a military capacity, have not been involved in any formal conflicts with internal rebel groups or similar, and have maintained excellent relations with neighbouring countries”. On the other hand, Mexico figures among the ten countries whose GPI score had deteriorated most between 2008 and 2013, while Argentina was considered to be among the ten countries with “the highest potential for small to medium deteriorations in peace between 2014 and 2016”. 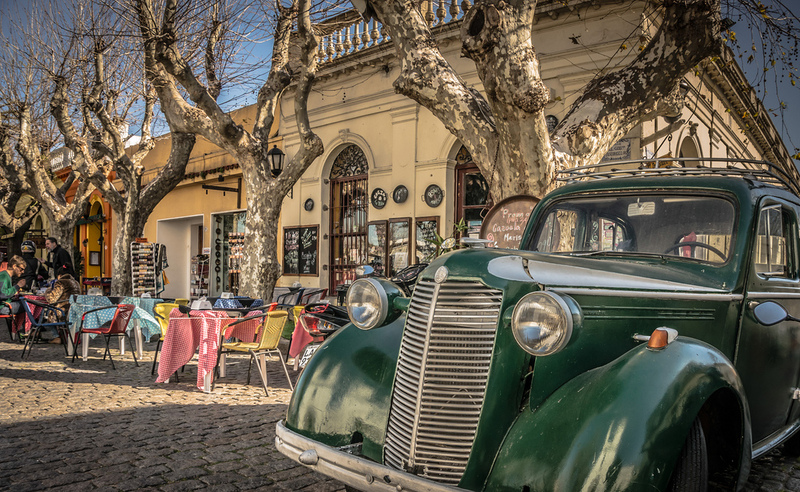 Colonia, in Uruguay, which was once again ranked Latin America’s most peaceful country. Photo courtesy of Boris G via Flickr. This year’s GPI report also includes case studies of 20 countries considered to have either a “democracy deficit” or “peace deficit” – defined as “countries with the largest discrepancy between levels of democracy and peace and vice versa” – and among the latter were included Colombia, Mexico, and Peru. Colombia, according to the study, has constantly been among the least peaceful countries in the Americas in recent years, due to the ongoing conflict between the government and the FARC, as well as more general problems such as crime, drug-trafficking and violence. This is in spite of the fact that “political stability has improved markedly over the past decade”, and the fact that it has “one of the oldest democratic systems in the Western Hemisphere” and ranks 57th out of 167 in the GPI’s Democracy index. The ongoing peace talks to try and bring an end to the historic conflict are seen as key to improving Colombia’s internal peace, but this will prove “challenging” given that “the presence of violent groups (fuelled not by ideology, but by drug-trafficking) and slow progress in tackling social ills (particularly high levels of poverty and inequality) will provide encouraging conditions for criminal activities”. Mexico, meanwhile, has over the past few decades “enjoyed general internal and external peace”, although “an escalation of drug-related violence since 2007 has brought further internal conflict” which the report suggests “shows no sign of abating”. The scale of Mexico’s military response to the ongoing ‘War on Drugs’ helps to explain its low ranking on “internal peace”, despite the fact that it has also “enjoyed a prolonged period of political stability since the 1920s”. Murder rates have tripled since 2007, reaching 21.5 homicides per 100,000 among the general population, although this rate has exceeded 100 per 100,000 in cities where turf wars have broken out among drug cartels and military forces. Corruption among police forces is also cited as a hindrance on government efforts to improve Mexico’s security situation, as well as a lack of confidence in police and judicial institutions. As for Peru, the report states that “the history of peace and conflict in Peru in the past five years is framed by institutional frailties and a conflict between the authorities and a violent Maoist guerrilla group known as Sendero Luminoso (SL, the Shining Path), which devastated much of the country during the 1980s and 1990s”. While the Sendero Luminoso has seen its capacity much reduced since then, it still causes sporadic outbursts of violence, mainly in rural highland areas. Peru is also said to have followed the more general trend among Latin American countries in strengthening its democracy over the past decade or so, ranking 61st out of 167 in the 2012 Democracy Index, but it continues to struggle to consolidate peace, as shown by its ranking of 119th in the 2014 GPI. There are also “sporadic outbreaks of violent social unrest” linked mainly to local opposition to the large-scale mining projects that have helped to drive Peru’s stellar economic growth in recent years. This situation is blamed to some extent on the fact that Peru’s institutions remain weak, while a “wide urban/rural divide” remains with the state having a weak presence in many rural areas. The study’s authors hold out hope that Peru’s economic growth coupled with social projects and “tangible evidence of a more inclusive social policy” will eventually help to alleviate some of the country’s internal tensions, but they warn that this could still take some time, during which these problems will persist. The violence in Mexico, fuelled by the government’s assault on drug cartels, has claimed tens of thousands of lives in recent years. Photo courtesy of The Atlantic.